Phu Quoc (Vietnam) — January 24, 2019 (travelindex) — Best Western Hotels & Resorts has celebrated the opening of a brand new upscale resort on the golden coast of Phu Quoc, Vietnam’s beautiful “Pearl Island.” Best Western Premier Sonasea Phu Quoc is a world-class beachfront resort nestled on the island’s west coast, just 8km from Phu Quoc International Airport. It officially opened its doors on January 20th, 2019, with a ceremony attended by senior executives from Best Western Hotels & Resorts, hotel owners and developers, and Phu Quoc Investment & Development JSC and CEO Group. Tropical pools, landscaped gardens and palm-lined paths flow all the way down to the beach — a 130-meter-long stretch of pristine sand, lapped by warm clear seas. Adventurous guests can take part in paddle-boarding, kayaking and body-boarding, while the resort’s Thala Spa is a luxurious haven of tranquility for those looking to unwind. A fully-equipped fitness center is also available, and young guests will be kept fully entertained at Nemo’s, the resort’s kids’ club. “It is an honor to be here with Phu Quoc Investment & Development JSC and the CEO Group to present this exceptional new hotel to the world,” Olivier Berrivin, Best Western Hotels & Resorts’ Managing Director of International Operations — Asia, told attendees at the opening ceremony. 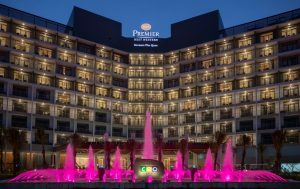 “At Best Western, we are always seeking strong and professional partners to work with, and CEO Group has shown its skill and vision by creating Best Western Premier Sonasea Phu Quoc. I have no doubt that this remarkable new resort will delight our guests and enhance the entire destination.